This is no great “epiphany moment” article, just a quick report on a real myeloproliferative neoplasm (MPN) symptom I experience from time to time. Most mornings, I make a healthy smoothie to get me up and rolling. This morning I grabbed the wrong ingredient and sprinkled it in the smoothie just like it belonged as part of the perfect recipe blend. 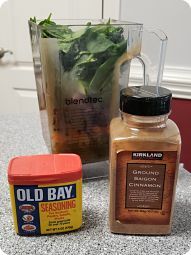 Guess which one doesn’t belong?….seriously?….you guessed it, I put the Old Bay Seasoning (great on seafood) in instead of the inflammation-fighting cinnamon. My gut reaction was to skim it out, but I thought what the hell, it was in too deep and I don’t dare start over, lol! So I blended all the healthy smoothie ingredients together and drank it like a man. Only tasted off a bit….but I cursed at myself anyway, thinking “this PV brain fog” got me again! I can walk upstairs sometimes and once I get to the top, it hits me “now what was I coming up here for?” When I call a close friend with a few things to talk about, sometimes I forget the most important item I wanted discuss. My friends are very understanding and welcome a call back when I remember (usually just a few minutes later). It gives them a little chuckle and I laugh at myself too. 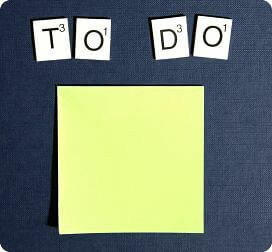 Part of this can be attributed to “middle age forgetfulness.” It’s normal to forget things on occasion. The fact it happens more than I would like and I’m not elderly, blame goes to PV (polycythemia vera). Has that sort of thing ever happened to you? I gotta admit, if I’m going to the grocery store for more than (2) items, I have a post-it note with everything I need to pickup….even if it is only three items. If I am out running errands, you better believe there’s a post-it note with each stop listed in sequential order. I’m actually a very well organized person, so post-it notes, to do lists, folders, story boards and even an “old timey day-timer“ are part of my daily routine. For a high-tech guy who built this website from a stark white canvas, I don’t trust my cell phone to organize the tasks that run my life. I prefer “good ole-fashioned paper.” The good news is, I know the difference between the brake and the accelerator….and I never forget that one! How do you know when you have a Real problem? Here’s a personal story that answers the question in a nutshell. My mom passed away a few years ago from the ravages of Alzheimer’s. It was a slow, nasty, tormenting decline (I’ll spare you the details). Since Alzheimer’s may carry a hereditary component, that concerned me. So I asked one of the attending nurses and told her my PV background briefly – “How do you know the signs of early stage dementia?” She gave me a perfect analogy: “When you loose (misplace) your car keys and find them later that is normal. When you find your car keys and don’t know what to do with it, THEN you have a problem.” That drove the point home for me….hallelujah, I’m normal (mostly)!